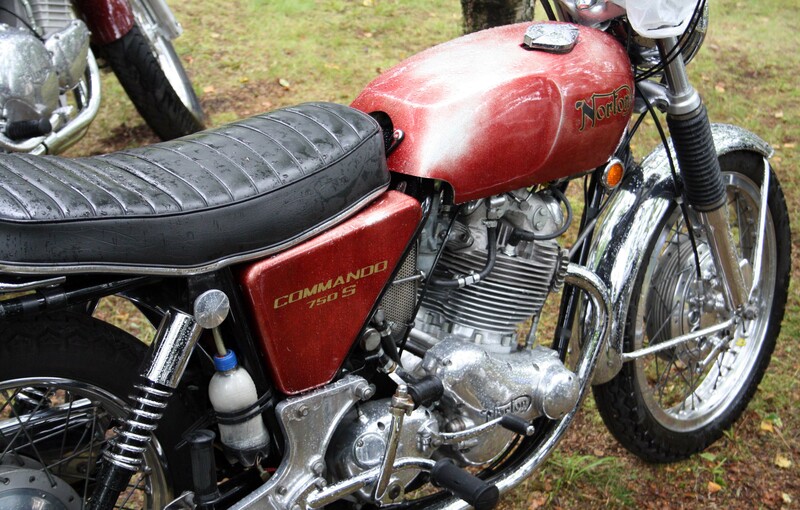 Discussion in 'Norton Commando Motorcycles (Classic)' started by Ron L, Nov 7, 2018. I'm trying to find a good match for the original Red Fireflake found on a '69 'S'. I realize that it was fiberglass gelcoat, but the sidecovers are painted yellow and the tank is steel (850 Mk III type). The original 'glass has been sanded down to the silver base and I can't get enough to show the original red shade to get it scanned for color. Has anyone found a system that comes close? Also should the flake size be .006 or .015? Any comments on base color? silver, black, red? Silver flake with translucent (candy) midcoat? Red flake with tinted midcoat, clear midcoat? This bike was red originally and I'd like to get it as close as possible. Don't know if this helps, but Brian Slark told me that the S bikes were all silver gelcoat, and the clear was tinted red or blue to order. When I sanded off my FF Blue covers and tank, they ended up silver flake so it makes sense that it was silver gelcoat and clear with coloring over that. There also appear to be black flakes in there somewhere. At least the sample picture I have left. 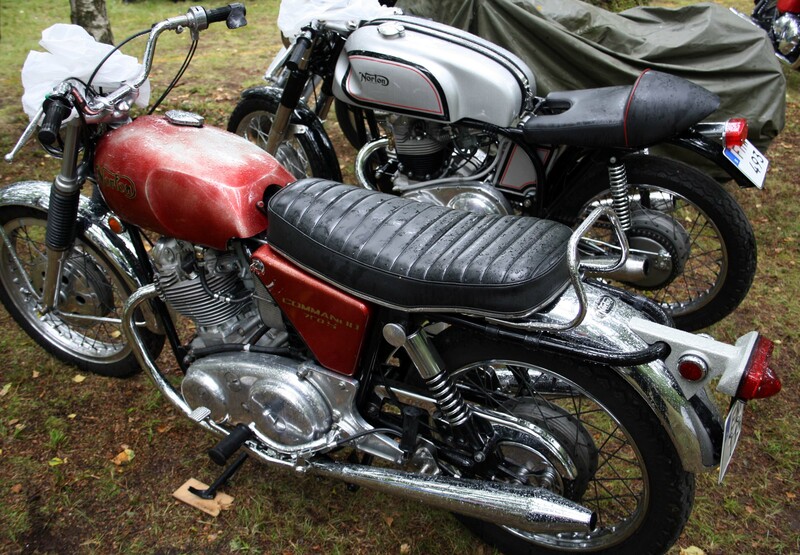 Is that side cover an unrestored original? This is the color that I and the bike's original owner remember. While I like the color of B+Bogus cover and also the one's in Brent's gallery, they are not the same. Brent did a super job on my P11 Candy Red, so no problem with his capability, but I really would like to find out how this is done. It almost looks like there is a black base showing through. Spotted this at the Swedish Britanniarally last year. One owner bike, original paint. Thank you. I believe that is very close. 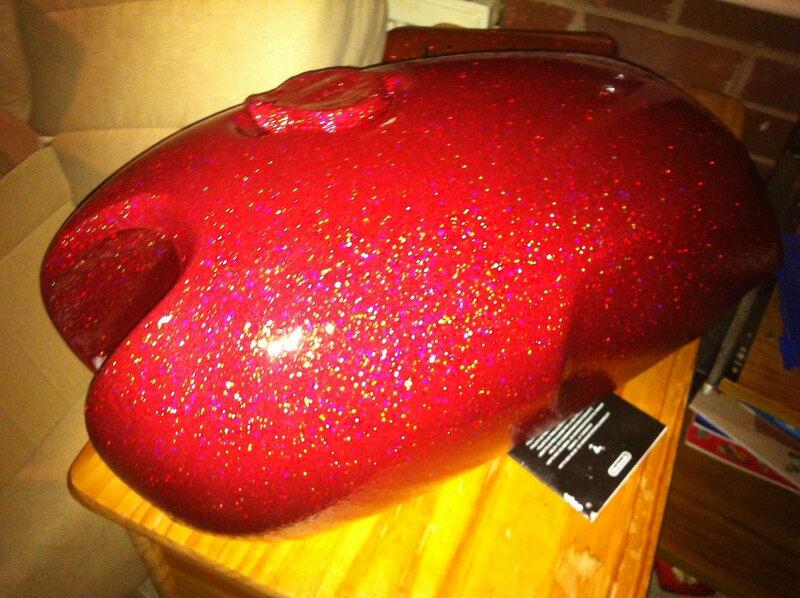 Red pigments used in the '60's and '70's were very prone to fade as I believe is apparent here (or perhaps the reflections), but if you look at the lower front edge of the tank it looks pretty good. Now, how do we reproduce this in modern painting techniques? Yes, a bit faded as one might expect after half a century of wear and tear but surprisingly lustrous. 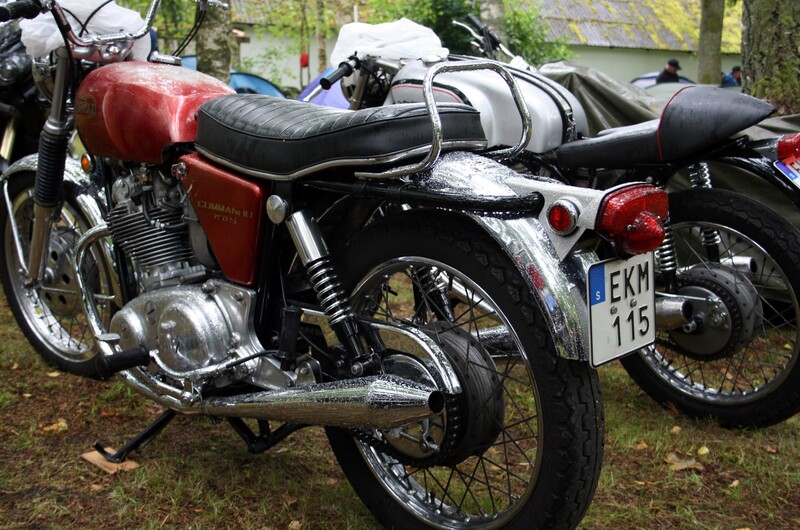 The owner restored the rest of the bike and had a bit of a struggle with deciding whether repaint it for a perfect finish or keep it as it was. I think he made the right call. Now, how do we reproduce this in modern painting techniques? House of Kolors has nice range of flake colors. They do indeed, and quite a few of their colours are spot-on. Unfortunately their red isn't one of them. Use the small silver flakes from them, I have an original Fireflake Royal blue side cover for comparison. Flakes are small, looks almost like a metallic color. 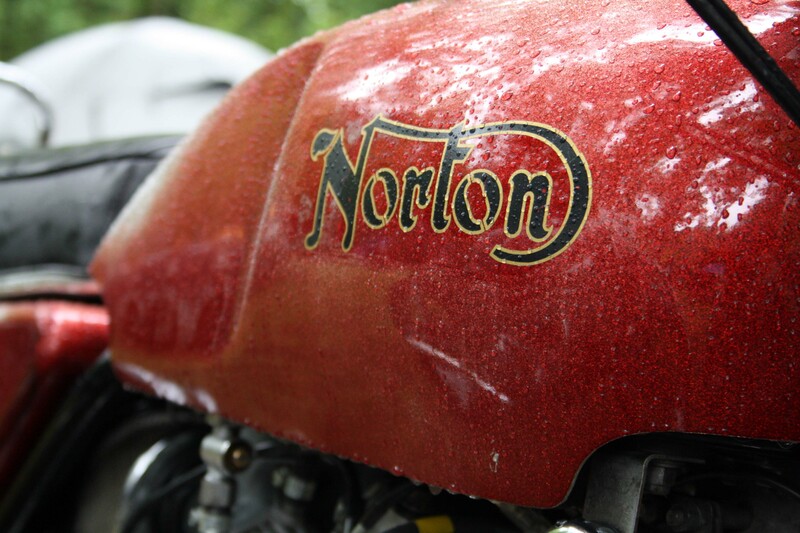 The original flakes back in the seventies are made by Metalflake Corp, according to Joe Seifert of Andover Norton / Norton Motors. Ive been painting 30 years.In that time, have never used Metalflake.I Will have too on my Emerald Green roadster,even though original paint is pretty good.The basecoat irc is really to dsiguise any areas of "patchiness" in the flake so I was told.It should be a close match for flake.On You tube "The Gun Guy" an Australian sprayer, has some good info on painting with flake. So, whose candy red do you prefer? I assume you add coats until you get the desired shade? And do you use .008 flake or a mixture of .008 and .015? I did a helmet and deliberately built up the red which became quite dark. It looks good, but not right for a FF red bike, so light coats sprayed from a good distance is the way. As has already been said, Norton flake was fine, so .008" is correct. Thanks, B+! I won't get around to it for a while, but I'll probably try a couple different things on a panel from the suggestions here and others. Then decide if I'm brave enough to shoot it myself or farm it out.